A 320-million-year-old shark tooth fossil has been discovered on the Geopark coastline and will be put on public display next week. The very rare and significant find was made Dr. Eamon Doyle a geologist with the Burren & Cliffs of Moher UNESCO Global Geopark. Dr Doyle discovered the tooth which belonged to a shark that once hunted during the Carboniferous period in the waters off Ireland at a time when the country was located close to the equator. “This shark tooth tells us that apex predators of up to 70cm were living here at the time. It is possible they were feeding on creatures known as nautiloids which are spiral-shelled creatures which grew to about 10cm where the tooth was found. These nautiloids were also predators and prior to this find would have been regarded as the apex predator. It is hoped that further finds will add more information,” he added. The fossil will be placed on public display on Thursday 25th May at an event, entitled There’s Life in the Old Rocks of Clare, in Ennistymon Public Library. 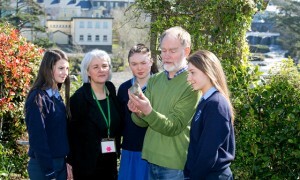 The event will mark the start of the annual Burren Rocks programme which will feature a range of fun and educational events exploring how the history, culture, flora and fauna of the Burren have been shaped by the region’s geology.